The EMANT3X0 has a pair of temperature sensing diodes D1 and D2, as shown in Figure 1. 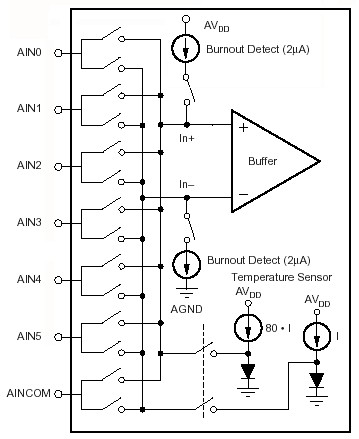 The differential inputs of the ADC converter are selectable via input multiplexers. The ADC inputs can be set to connect to the temperature diode outputs. The differential voltage of the diode pair provides a temperature reading. Equation 1 shows the PN junction ideal diode equation. ID is from a constant current source. One value of α that gives good results is 2664.7. The value of α can vary from part to part and is determined from experimental data and calibration. Heat generated by sensors when power is applied causes self-heating. This affects the calibration coefficient. The device heat dissipation is proportional to the power supply voltage, operation frequency, and on-chip operating features. The LabVIEW VI that reads the voltage across the diodes, converts the voltage to temperature is called EMANT300 Example Diode Temperature.VI Please note that for the ADC voltage reference to work, REFIN- pin 4 of the DB25 connector needs to be connected to AGND. If you have connected the Light Application Adaptor, REFIN- is already connected to AGND.